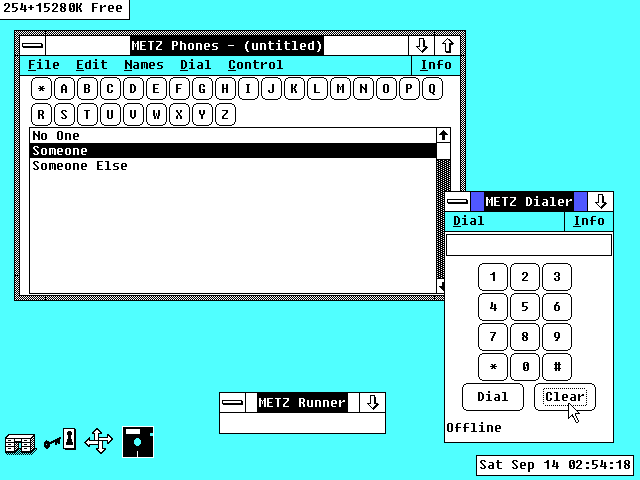 While looking for Windows 2 applications, I stumbled upon several revisions of the METZ Desktop Navigator. This is a Windows 2 compatible application, even though the later versions were intended for use under Windows 3.0. 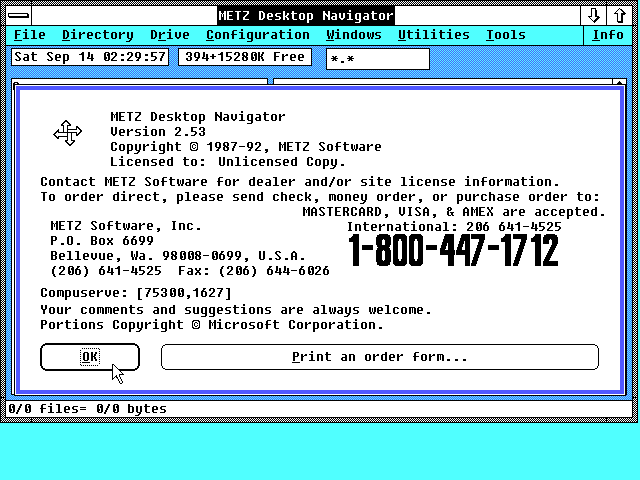 METZ Desktop Navigator is a shareware product, and displays a nag screen every time you start it up. It is somewhat similar to the Windows 3 File Manager. It displays a tree of ALL directories on one side, and a file list on the other. You know how DOSBox tells you not to mount your root directory as the C drive? This is why. Programs like this attempt to recurs and load ALL of the directories. Which was fine back on a 20 or 40 megabyte hard drive, but not on a 500GB drive with thousands upon thousands of directories. You can copy files between directories using a menu option and the above selection dialog, but it does not support drag-and-drop. Among various other functions, you can search for files by filename. The results of the find operation appear in right pane where you can perform file operations on them. Desktop Navigator has a "Tools" menu that you can use like a "Start" menu. You can customize it via the "Customize..." menu option. You select the files you want with point-and-click using a graphical dialog and file selector. 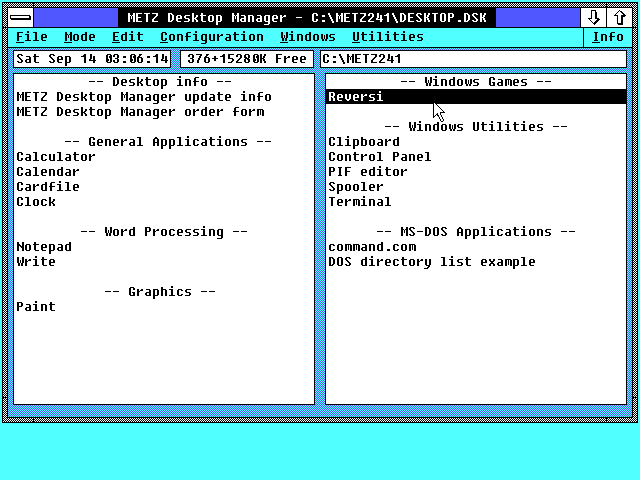 METZ Desktop Navigator provides options to re-arrange open windows as a cascade or as tiles. 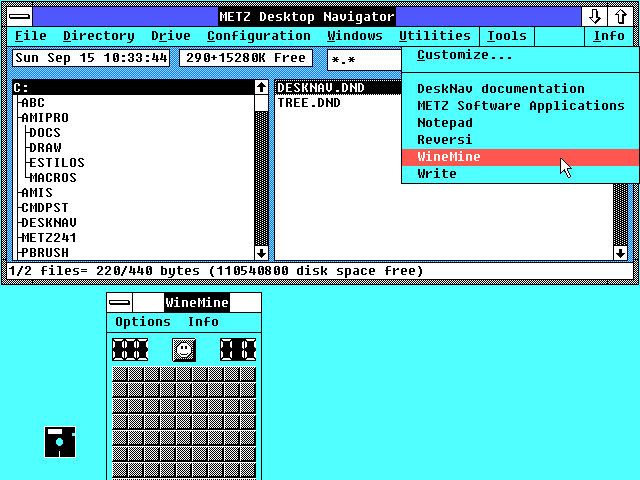 The METZ Desktop Navigator also includes a screen blanker, that will blank the screen after so many minutes of inactivity while the program is running. 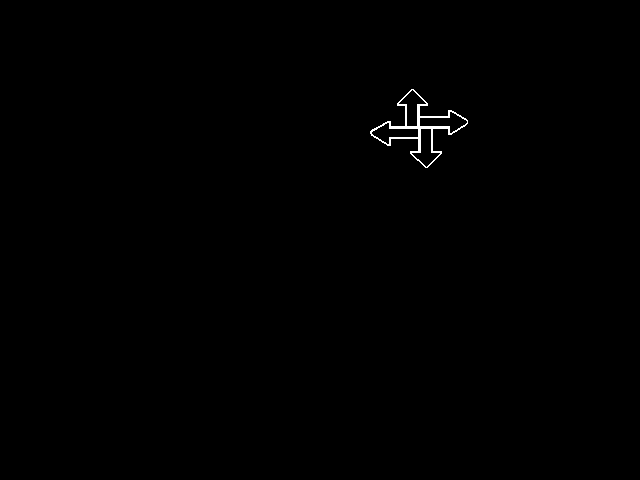 An earlier version of Desktop Navigator also includes Desktop Manager. Desktop Manager offers a list of available programs, similar in function to the Windows 3.x Program Manager. There are no graphical icons, and it does not use a Multiple Document Interface window. Since Desktop Manager was not a "standard" shell, SETUP programs will not add themselves to this shell. This earlier version also includes a number of other applications, including a floating clock, and several dialers. 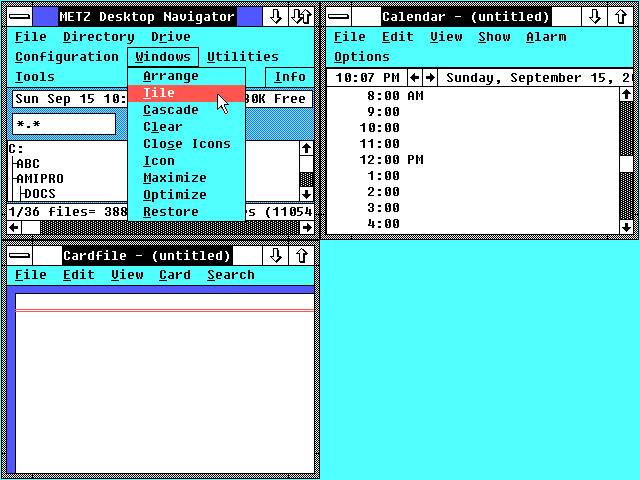 In conclusion, the METZ Desktop Navigator and Desktop Manager make Windows 2.x feel a bit more like Windows 3. Although it is not a Macintosh-like desktop, it provides a number of advantages over the normal MS-DOS Executive.